Ever wonder why the Santa Barbara Municipal Airport is smack dab in the middle of Goleta? It’s kind of an unusual situation. 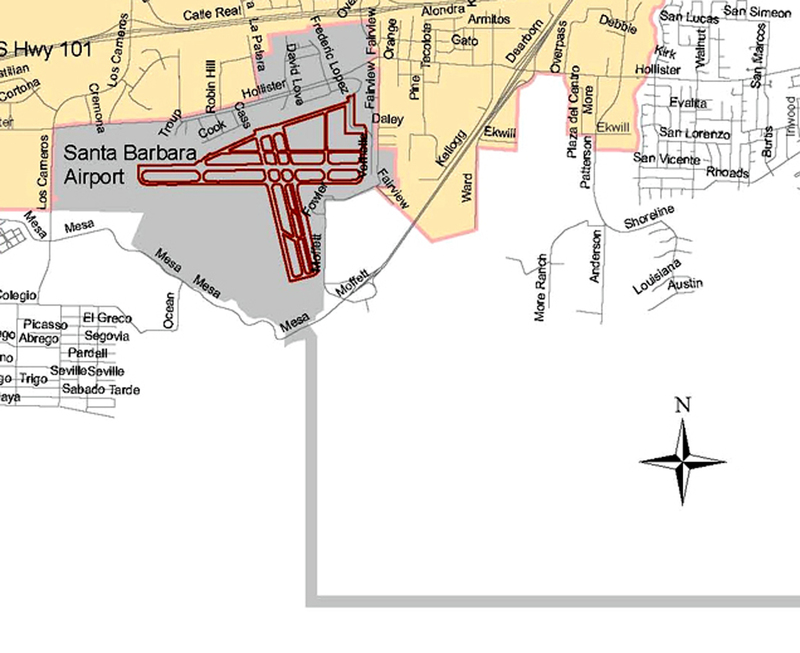 Look at a map and you’ll see the airport is surrounded by Goleta, but Santa Barbara is connected to the airport via a thin strip of ocean that goes out to sea, and then back to land in Santa Barbara proper. This is what’s called a Shoestring Annexation, a fancy maneuver that was only used a few times and has since been made illegal. The real estate that the airport sits on was annexed to the city of Santa Barbara by 7 mile long “shoestring”, that’s only 300 feet wide, and the majority of it is under the Pacific Ocean. How did this happen? The situation hatched in 1931 when the Santa Barbara City Council voted to terminate Earl Ovington’s permit to operate the only airport in Santa Barbara, which was in the hilly terrain of Samarkand. This left the airfield in Goleta as the only viable spot for an airport. Soon, movers and shakers were pushing for the construction of an airport Santa Barbara could be proud of. In 1940 T.M. Storke managed to get a promise from the federal government to build a modern airport at Goleta, if Santa Barbara could provide the real estate, which they did. After the bombing of Pearl Harbor, the construction of the airport at Goleta was taken over by the U.S. Navy, and it was built in record time. They all but destroyed Mescaltitlan Island for fill dirt to transform the Goleta Slough into runways. For five years the Santa Barbara airport served as a Marine base. In 1947, the federal government turned the airport back over to Santa Barbara County. In the late 1950’s the city of Santa Barbara decided they wanted to annex the airport to collect taxes from business taking place on airport property. Their original idea was to link the airport to the city by a corridor running along the mountains, but there were too many landowners to deal with. A News Press reporter came up with the crazy idea of connecting the airport by an offshore corridor, but one local politician didn’t think that idea was so crazy. Santa Barbara had just created an “oil sanctuary” out to the three mile limit to keep the unsightly oil platforms from tainting their views. Mayor Jack Rickard was convinced he could annex this sanctuary, which ran from Ortega Hill to UCSB, thus connecting the airport to the city. This plan met heavy opposition, so in 1960 they came up with a “horizontal annexation” of water only, waiving mineral rights under the ocean floor. The plan was accepted, but the state immediately plugged the legal loophole to keep this “gerrymandering procedure” from ever happening again. In 2012, a new terminal was completed and the Santa Barbara city council debated naming the new building or leaving it as the Santa Barbara Airport Terminal. The public was invited to provide input and although many people suggested that Goleta or Goleta Valley be incorporated into the new title, the terminal was named after Mayor Jack Rickard, “since he is credited with figuring out a way to get the airport annexed to Santa Barbara”. To quote Nick Welsh, “In one of the most brilliantly sneaky legislative moves ever, Rickard would seize upon this obscure fact when seeking to annex 800 acres of land right in the heart of Goleta and home to what was then Santa Barbara’s fledgling airport. The state legislature, dazzled by Rickard’s ingenuity, passed a law prohibiting anyone else from ever doing the same thing.” And the rest, as they say, is history…..
Nicely written Mr. Modugno. I see Lake Los Carneros in the lower left of the aerial photo. And I see a short, but windy “riverbed” at lower center of that photo that interests me as well because, the other day I noticed what looked like the dry remains of a river (probably only an inlet to the ancient marsh) heading from NW to SE on the site of the future Jordano’s headquarters. Thanks! Not sure what you see in the photo, but there was a lot of marshland in that area. Keeping Local history alive, way to go!